Derek Ryan's Irish Jasper made it three wins in a row with an open-lengths score in the Grade 3, $150,000 Victory Ride Stakes Saturday at Belmont Park. Ridden in midpack early by Javier Castellano, Irish Jasper came with a rush to take the lead in mid-stretch and pull away, crossing the wire in a time of 1:16.70 for the six and a half furlongs after opening fractions of :22.01 and :45.62. Favored Enchanting Lady dropped back on the far turn and put in a belated rally on the outside to take second. Kathballu was third. After unsuccessful tries stretching out and on the turf, Irish Jasper won the Belle Harbor Stakes at Aqueduct before taking the G3 Miss Preakness at Pimlico May 15. She has six wins and a third in nine total starts. Owner Ryan also trains the 3-year-old filly. Bred in Kentucky by Mr. and Mrs. Robert E. Courtney, Sr., Irish Jasper sold for $12,000 out of the Stonebridge consignment at the Fasig-Tipton October Yearling Sale in 2013. She is by First Defence out of Irish Connection (Mr. Greeley). 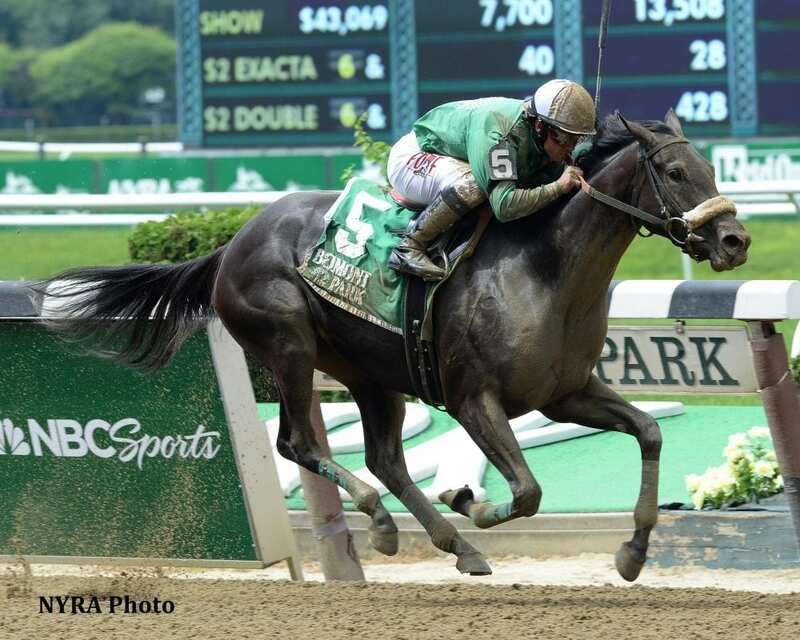 This entry was posted in Racing and tagged belmont park, Derek Ryan, enchanting lady, Horse Racing, irish jasper, Javier Castellano, kathballu, Paulick Report, thoroughbred, Victory Ride Stakes by Paulick Report Staff. Bookmark the permalink.